In fragile and crisis contexts, migration drivers and decision-making are shaped by constantly evolving social, economic, political, security and environmental factors that define the landscape of risk and opportunity for potential migrants, including the displaced. In response to this, IOM’s stabilization and recovery programmes work to create conditions for the restoration of normal social, economic and political life, by contributing to restoration of basic rights and security, and by promoting social cohesion, functioning state governance, non-violent political processes, effective social policy, livelihoods and service delivery. As part of its global migration mandate, IOM’s Transition and Recovery Division, within the Department of Operations and Emergencies is focused on promoting prevention and progressive solutions to complex migration dynamics within crisis and fragile contexts. The Division oversees community stabilization programme initiatives, as well as recovery, resilience and transition programmes which help reduce humanitarian need, and operationalize development-oriented responses to displacement and migration challenges. IOM has over 20 years of experience implementing stabilization programming in complex crises contexts. IOM’s institutional expertise and on the ground operational presence allows a tailored approach to migration and displacement challenges through stabilization programming. 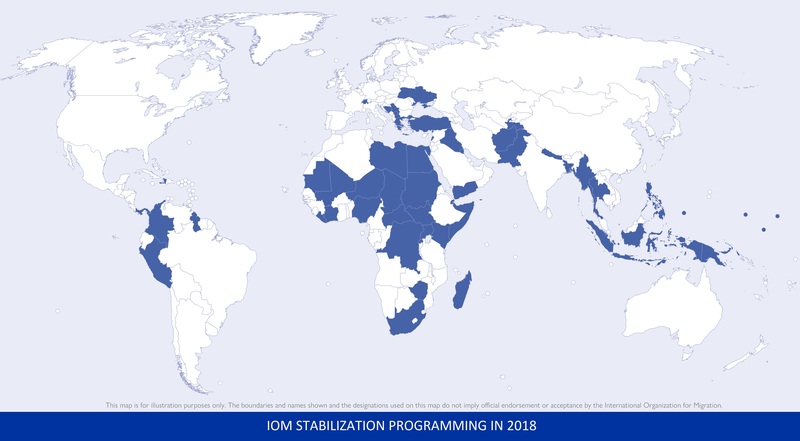 As of the end of 2018, IOM has 180 stabilization and recovery projects being implemented in 53 countries. In addition to projects that target specific crisis recovery needs, the majority of IOM’s Stabilization programming is performed using the Community Stabilization Approach. These programmatic interventions comprise locally-driven, development-principled programming in crisis or fragile contexts, which aim to prevent, mitigate and reduce the drivers and negative effects of displacement, irregular and return migration related to natural and/or human-made crises. IOM works with governments and individuals at the local, community level to promote stability as a step out of crisis or fragility, paving the way for more sustainable development approaches. IOM’s Community Stabilization programmes respond to evidence of displacement and migration patterns, and are tailored through an analysis of context including socio-economic, political, security and environmental factors that drive risk and vulnerability. These initiatives contribute to the sustainable protection of vulnerable groups by delivering direct assistance, improving services and governance, and generally promoting local ownership. They empower local actors to design, implement and monitor the processes. They also improve safety and security by working across peace and development frameworks to address longer-term effects associated with protracted displacement, and negative migration pressures associated with state fragility. IOM uses a community-centered methodology, where local communities, vulnerable and marginalized populations (IDPs, refugees, ex-combatants, women, youth), local authorities, and members of civil society, are involved in all phases of project development, implementation and monitoring. This process can help produce empowered communities, strengthened support networks, improved social cohesion, improved capacity of community members and structures and local ownership leading to more sustainable recovery outcomes. IOM Community Stabilization programmes operate at the local level in order to build stability from the ground up and take advantage of IOM’s presence and relationships in the field. IOM’s Community Stabilization interventions can be implemented during any phase of a crisis, preventing forced displacement by addressing at-risk community drivers and root causes as soon as they are identified, mitigating the longer term effects of displacement during the crisis and addressing the impact of displacement on return communities by ensuring sustainable reintegration of returnees. Using the flexible, community-driven process, programming is designed to respond to the changing circumstances in context as well as changing community priorities throughout the lifespan of the program. By integrating continuous monitoring, evaluation and learning during implementation, new opportunities can be identified and projects adjusted to suit the contextualized needs at the community level.